Mudjacking is a term used to describe the procedure of raising a sunken concrete slab by forcefully injecting a thick grout mixture underneath it until the slab rises up back to its original position. Different contractors use different terms for this procedure. Some call it Mud Jacking, others call it Slab Jacking or Slabjacking. No matter what they call it, the process is the same. They will use these terms interchangeably. Why Does a Concrete Slab Sink Anyway? A walkway, patio, driveway, porch, garage or pool area usually sinks because of one of two reasons. 1. The dirt underneath the slab wasn’t prepared properly. It wasn’t compacted. Home builders tend to do a good job with preparing the job site for where the house will actually sit, but they sometimes neglect to put in the effort to prepare and compact the soil around where the home will be. So the driveway, front walk, back patio or walkway around the garage is built on backfill that could have been compacted better. 2. Some type of sub-surface erosion has occurred due to water runoff or other problem which has removed some of the soil beneath the surface. This creates a void that will, over time, not be able to properly support what is sitting on it. So What is the Typical Slab Jacking Process? Ya good technician will examine your property and assess the situation. If he or she determines they can fix your problem, they will get started. They will first drill a few holes in your sunken slab. They don’t drill them randomly. It’s important they drill them in the right spots. They will then forcefully, but slowly, pump in a mixture of cement and sand, which they commonly call grout, through each hole. This grout mixture first fills up any voids underneath the surface and then actually starts to raise up the slab to the proper height. Once the slab is level and at the desired height, the area is cleaned up and the holes are patched. What are the Advantages of Slabjacking? When you consider the alternative to slabjacking would be breaking up the concrete, regrading and pouring a new slab, you can see what a terrific option the slabjacker provides. — It’s fast, your work will be done in one day. — It’s much less expensive than demolitioning your old slab and laying a new one. — It causes very little disturbance to nearby trees, shrubs, flowers, grass or structures. — You don’t have to wait for a new slab to dry. What Does Mud Jacking Cost? 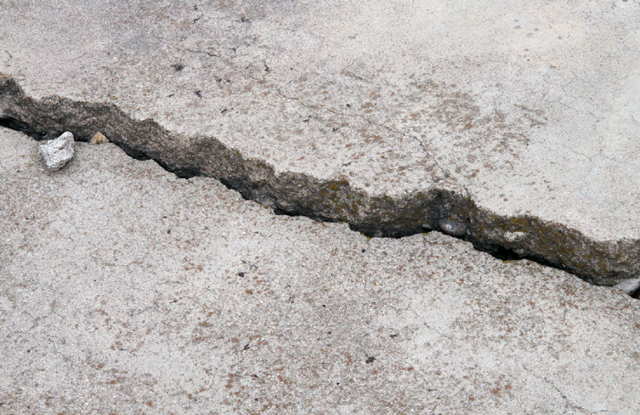 A professional slab jacking company can provide you with an estimate on your project. They may need to see your job before they give you a firm bid. The truck and equipment these technicians use isn’t cheap, and the process will take several hours to complete. But the good news is that it will be much less than having the slab replaced.